We are writing you today with mixed emotions. Candace Lee has decided to step down from her role as Executive Director at the end of 2017. Since returning to ValleyArts in October 2015, Candace’s leadership and dedication to our mission has contributed immeasurably to the growth and vision of ValleyArts. Although saddened by Candace’s departure as Executive Director, we are pleased to announce she will remain part of ValleyArts as Director of Development. We look forward to her continued guidance as an important part of our organization. In light of Candace’s departure, the Board of Trustees is now positioned to hire a new Executive Director who will allow us to remain focused on our mission of building community through creativity, while increasing our fundraising and visibility. To this end, the Board of Trustees has asked Jeremy Moss to serve in this role, effective January 1, 2018. Jeremy has worked as our Deputy Director since October 2016 subsequent to serving as our Director of Marketing. Prior to that, Jeremy worked as a consultant and volunteer with ValleyArts since 2010, and he is familiar with our programs, funders, and needs. As an artist, resident of the Valley Arts District, and active participant in the local arts scene and community, Jeremy is well-suited for this position, and has been working closely with Candace for the past year to ensure a seamless transition for our organization's continued growth and success. 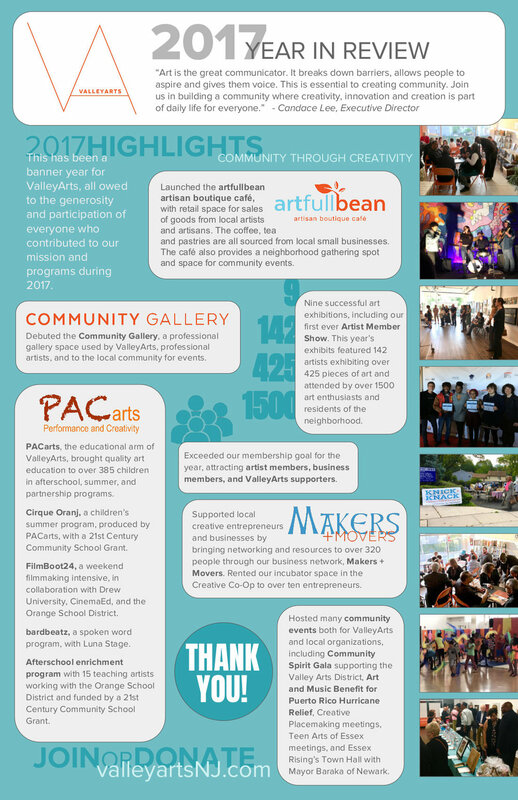 ValleyArts plans to continue the good work it has been doing for the past 12 years in the Valley Arts District, from programs for the community and youth to providing opportunities for artists and local entrepreneurs. If you have questions about ValleyArts, I would be happy to answer them. In the meantime, please congratulate Candace on all that she has achieved, and wish Jeremy every success in taking us forward.